[Rajendra] found an easy way to make a USB temperature logger. He already had a USB to UART adapter that takes care of the heavy lifting. On one end it’s got the USB plug, on the other a set of pins provide a ground connection, 3.3V and 5V feed, as well as RX/TX lines. To get the hardware up and running all he needed was something to read a temperature sensor and push that data over the serial connection. An 8-pin microcontroller in the form of a PIC 12F1822 does the trick. It runs off of the 5V pin on the USB-UART, and uses the ADC to get temperature data from an MCP9701A sensor. The sample rate is hard-coded into to the PIC’s firmware, but adding a button, or coding some serial monitoring could easily make that configurable. [Rajendra] used Processing to write an app which displays the incoming temperature info and uses the computer to time-stamp and log the inputs. We could see this as a quick solution to tracking wort temperature during fermentation to make sure your beer comes out just right. What USB-UART adapter is that? Silabs CP2102, pretty nice chip, I prefer it over the FT232 and PL2303. The intro basic stamp kit will do this and has a lower entry point as it’s programmed in basic. 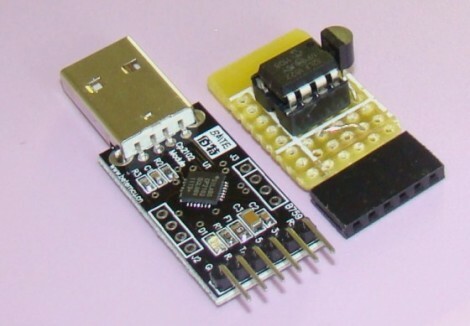 you could use even fewer parts by using an attiny25, which has a built-in temperature sensor. Interesting hack but you could have used a PIC18F13K50 which as A2Ds and a USB port built in. Still the original is kind of cool. If he had all the parts it would have been fast to do. And use the internal temperature indicator of 12f1822 ! Wow!. $3.90 for a USB-UART bridge. Is cheaper than cheap. Nice Project,good writeup and like this processing thingies. Have a few applications in mind myself. Does anybody know if Processing has USB wrappers something along the lines of PYUSB?? Hi Guys, you can find the USB-UART adapter from here. There is an other USB-UART adapter,which you can select add Bluetooth module and we will welding it on the bottom for you. I guess I’m kind of confused. This has been done a billion times over and published on the net, yet it seems to be published here as something new and exciting…. What exactly is going on here? Have you guys not seen a microcontroller before? Are serial ports becoming the future instead of the past? So much wasted space…this could be done using a Teensy 2.0 with a single thermistor soldered directly to the board. Still, the PC side of it isn’t bad. Thanks I never saw the Teensy before. Handy little device. There are a million ways to skin this cat cheaply and easily, and Rajendra’s is a fine example that met his needs and likely his junk box contents. just throwing this out there, many of the new pic micro’s have a built in temperature probe, no need for any the external sensor. Where to buy the female 6-pin header with protoboard already attached? That’s cleaner than trying to cut my own with a larger board.